The competition began on Thursday 9 August 2012 and finished with Morrisseys defeating Poulmucka in the 2012 final. Cahir Park AFC's James Darcy, Mark Costigan, Eamonn Wootten, Darren Sweeney, Sean Kiernan, Keith McGuire, assistant referee Sean Coffey, captain Pakie O'Dwyer, mascot Aoife Collins, referee Gerry Ward and assistant referee Leo Coffey ready for action before Cahir Park take on the Irish Paralympic team on July 31. The Cahir Park AFC Veterans Centenary Quadrangular Tournament took place on Saturday 2nd October, 2010 featuring teams from Cahir, England (Springfield from Chelmsford), Kerry (Tralee Dynamos) and Dublin (Peamount United). The home team beat the lads from England 4-2 in the Anthony Cunningham Memorial Cup, the first game of the afternoon, with two goals from Phil McGrath. Gerry Fitzgerald and Franny Harpur's side had a say with a brace scored but it was not enough with the hosts adding two more through Norman O'Brien and Kenny Cunningham. Cahir Park then entertained Dublin side Peamount United in the Quadrangular Centenary Final after they had overcome Tralee Dynamos, with Edgar McGrath, by a scoreline of 1-0. Ger Quinn's Dublin representatives were crowned the champions of the day beating the Park 3-1 in the final. Tom Kelly, the Park's oldest surviving player, presented the Cup after an exciting final in which Peamount were first to score. After a penalty miss by Phil McGrath, United redoubled efforts and were two ahead before the break. When a third was added it was all over as a contest, Norman O'Brien's strike from 20yds serving as no more than a consolation for the home support. Played in front of an appreciative audience on a sunny afternoon, a great sporting occasion took place at the Park on Saturday last with the arrival of the Irish paralympic team, ranked fifth in the world. True to form, there followed a competitive game at a high tempo with lots of chances for both sides in a gripping encounter. With youth once again given it's chance in the senior side, there were impressive performances from Pa Fitzgerald at left back, from Sean Kiernan in midfield and from Eamon Wootten and Mateusz Marciniak up front whilst goalkeeper Darren Sweeney had to be on his toes throughout the afternoon. With the paralympians first to show intent with a cracker coming back off the crossbar, Fitzgerald found himself free on the right and after a fine solo run, crossed for Keith McGuire to shoot just wide. Efforts from James Darcy, Anthony Ward and Craig Condon also proved fruitless in the seven a side encounter. After the interval, a fine save from point blank range in a one on one situation saw Sweeney keep the home team in it as the visitors turned up the gas. Making good use of a crowded subs bench, the recalled Mark Costigan was to provide the finish that would be the difference between the sides when a brilliant three-man break involving Darcy, Shane O'Regan and Costigan was finished cleverly. Captain Pakie O'Dwyer's troops turned on the style for the final few minutes as the FAI-trained team began to rue some poor finishing on the day and with Wootten foiled after a fine run from midfield and Kiernan blasting wide just on referee Gerry Ward's full -time whistle, both teams came away from an encounter providing a worthwhile run-out. CAHIR PARK AFC Squad: Darren Sweeney, James Darcy, Keith McGuire, Sean Kiernan, Pa Fitzgerald, Eamonn Wootten, Pakie O'Dwyer, Mark Costigan, Shane O'Regan, Mateusz Marciniak, Craig Condon, Anthony Ward. A lively game with evenly matched teams contesting every ball before Carrick finally got the upper hand with a goal in each of the extra time periods from Owen Burke and Glen Keane. John Walsh playing a man-of-the-match performance. A mostly one-sided affair with a clear winner from early on with goals from Pa Quinn, Danny O'Brien and Michael Fitzgerald. Jimmy Carr with a man-of-the-match performance. Clonmel Town: Stephen O'Neill, Darren Burns, Ronan Stanley, John Shanahan, Stephen Ryan, Tony Scully, Ian Barnes, Aaron Moroney, Dwayne Burns , Evan McGuire. Subs: Barry Ryan, Rory Kiely, Tony Davis, Evan Comerford, Niall Kelly, Peter Acheson, Barry Murphy. 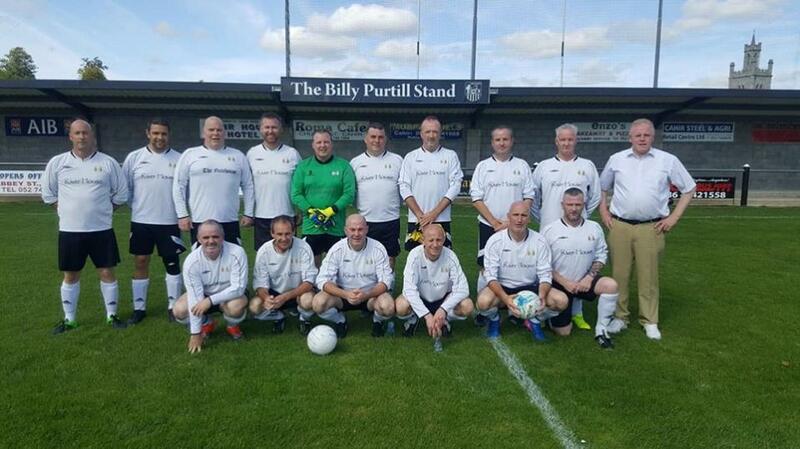 St Michaels FC: Derek Breen, Paul Tobin, Chris Higgins, Paul Breen, James Walsh, Trevor Cosgrove, Thomas Fahy, Davy Ryan, Pa Quinn, Danny O'Brien, Jimmy Carr. Subs: Ray McMahon, John Connery, Timmy Kiely, Sean O'Halloran, Wayne Rogers, Michael Fitzgerald, Paul Kennedy. A lacklustre semi-final went to the second period of extra time before providing a winner - Tony Scully scoring from the edge of the box put paid to 10-man Villa. Stephen Ryan (Clonmel Town) voted the John Quirkes Jewellers' Man of the Match. Clonmel Town: Richie Ryan, Darren Burns, Ronan Stanley, John Shanahan, Stephen Ryan, Tony Scully, Ian Barnes, Adrian Cleere, Aaron Moroney, Barry Ryan, Barry Murphy. Subs: Rory Kiely, Evan McGuire, Tony Davis, Niall Kelly, Jack English. Villa FC: Liam Kavanagh, Des Mullett, Simon Keane, Declan Furlong, Ian Hatton, Nicky Corcoran, Ian Cantwell, Stephen Murphy, Paul Omateso, Danny Walsh, Jimmy Barry. Subs: Martin Strumel, David Murphy, Robert Bresnan, Eoin Giruity, Demitri Laeare. at the Park on the evening before the July 31 2010 clash v Cahir Park AFC.